I realize the last blog was a little vague. I will now open up to questions. Q: Can I have your autograph? A: Yes. Questions about my trip please. Q: Is it true that the girl who sat next to you on the train gave you her phone number without being prompted? A: umm, yes. How do you know about that? Q: Where were you headed on Tuesday? A: Good question, I was headed to Geneva, Switzerland. I spent a few very pleasant hours exploring the snowy city. I enjoyed walking along its picturesque waterfront, a tree-lined street above an enormous blue lake. From there I got on another train to Morgins, Switzerland. 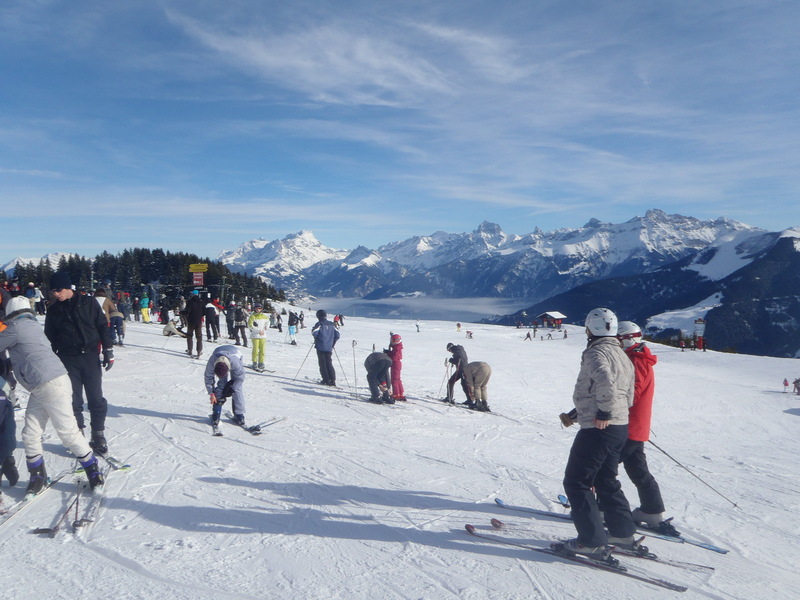 I spent Wednesday and Thursday skiing in the Switz Alps. 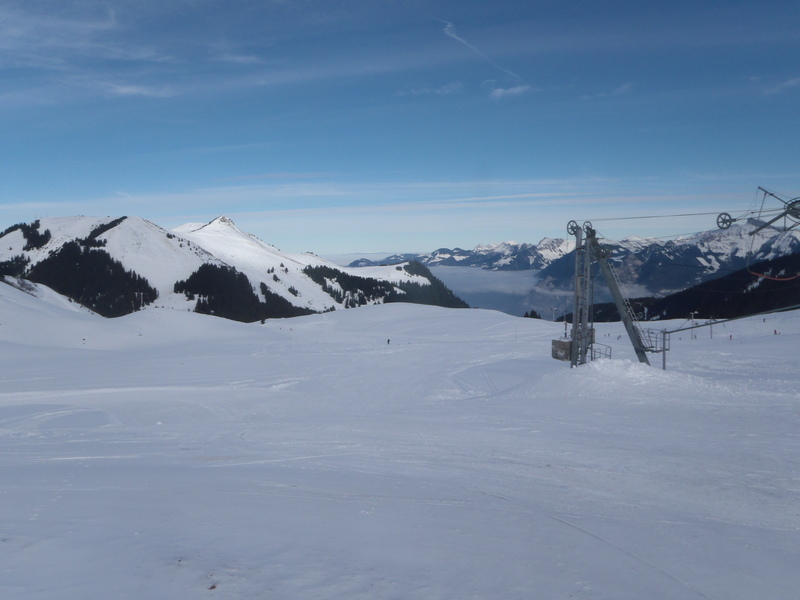 Q: … off of the ski lift? A: If you already know then why are you asking. Maybe I had better just tell my story. I was in math school. It was my last year and I had by then unsuccessfully asked out all of the girls who were showing up to the senior courses. This class was Measure Theory. The professor wrote on the board, line after line of proof and there might have been one student in the first row who was able to follow. Not only did she have a boyfriend but she told me this as he was sitting next to her in the library when I made my move. My mind wandered on to daydreaming on another subject. There was a new chick sitting behind me to the right. Oddly, I hadn't seen her before. How to go about it? The professor droned on, and occasionally I would make a vague effort to figure out what was happening up at the board, but it was hopeless. I would have to learn the material on my own some time later. The class was over, and I heard her talk to another student, in English! Nobody ever spoke to each other in English. She didn't speak a word of Hebrew, not only would this give me a conversation opening “Hi, I'm Dov and I'm American.” But it would mean that helping her translate things would give me an excuse to spend endless time with her. There is not a lot of English in undergrad courses at Hebrew U.
I skied quite a bit while growing up in Albany NY, downhill and cross-country, and while I never got to be any good, I was adequate and I loved it. 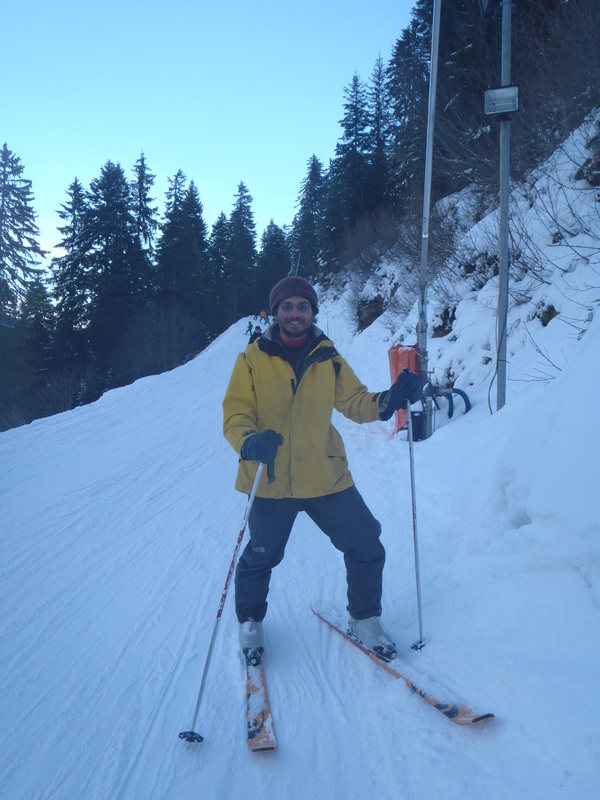 This was over a decade ago, I have not been skiing since I moved to Israel in 2001. About a year ago we made plans. I would go with her to Switzerland for a little over a week during winter break and we would ski. They had all the equipment I might need and their cabin was a five minute walk from the lift. But it was not to be. At the last minute, the plans fell through. Now, passing through Geneva, I remembered these plans. I might never be closer toSwitzerland than I was, and Pocahontas was there too, visiting her family. I was invited to go skiing with her Wednesday and Thursday. 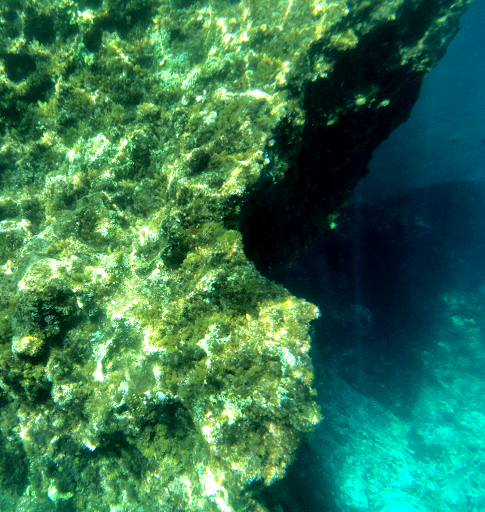 So I took the train and blogged last while on it. On the train I was thirsty. I had with me my water bottle, but my lunch was in it. I don't like to be thirsty. I found the restaurant car and asked if I could get free water. No, I was being silly. If I wanted water I could pay four euro for half a liter of it. Their were sinks in the restrooms on the train with signs saying “not for drinking”. I tried tentatively, tasting the water first. It tasted fine. I wondered why the train would have undrinkable water on it. Where would they get the water from to put on the train? Was their soap in it? I didn't know, but I was thirsty. I drank. The next day Pocahontas and I put on our skis, and took the lift up the mountain that overlooked the little village. The lift was a bench with a back suspended from a wire. It had a bar that came down in front, and a second bar to rest the skis on. The weather was in the upper 30's and the mountain was covered with snow. The view was stupendous. I was confident I would remember how to ski. Coming off the lift I discovered that I didn't. Seeing my predicament, Pocahontas suggested we start with the bunny slope. I was pleased, only to discover that this “bunny slope” was a Wild Descent of Death. Nothing like the gentle bunny slopes I grew up with. I made the descent twice and felt confident that I had a handle on things and was ready for something a little more challenging. After that bunny slope I could handle anything. Good god, I was both right, and wrong. I had a lot of fun, but Pocahontas's idea of easy was harder than anything I had ever done before in my life. And I learned to ski. By the end of the day I had not only reclaimed my previous skills long untouched, but I may have been skiing better then ever before. I had to. One trail after another on the top of the mountain, the runs and the rides back up werefairly short. At the end of the day we took one long narrow path through the woods and along cliffs until we found ourselves back at her village. It was fantastic. Pocahontas' family is very nice. Her father, a neuroscientist at the University of Geneva assured me that alcohol does not kill brain cells while they are in your head. On a petri dish, sure, but not while they're in your head. My reason for not drinking was thus fantasy. Her sister just finished medical school to decide she wanted to get into film. Following a dream is something I can appreciate. 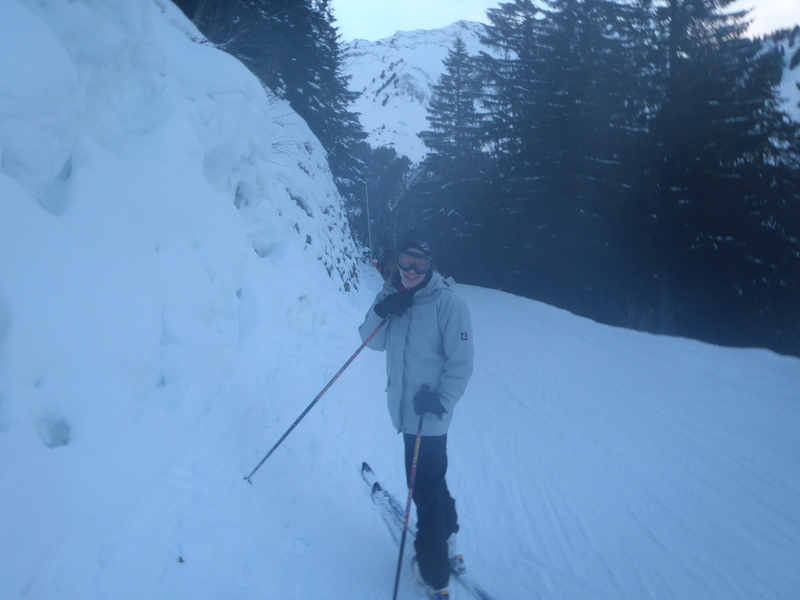 My own had just got me a day of skiing in the Swiss Alps, a day I will remember for a very long time. The next day we were on a different mountain. The trails were not so wide and open asthe day before. Longer and not as hard, it was even more fun, though I might have thought that impossible. Through the woods, over bridges, and down the mountain. We sped* down great white slopes from Switzerland into France. We had a view of the tallest mountain in Europe and admired the occasional old cabins and tiny villages that dotted the white peaks. Some of the cabins had been turned into restaurants for the skiers. 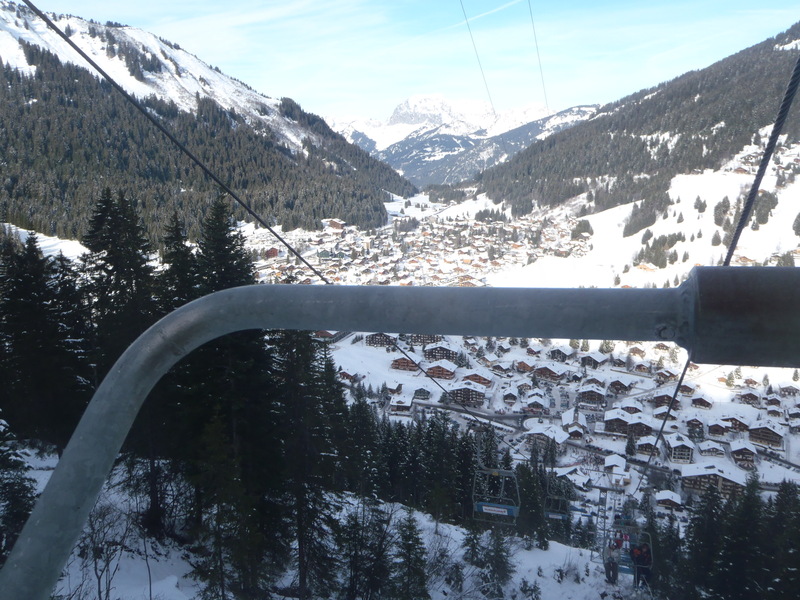 Most of the lifts were not chairlifts on this side, but long poles that came down from cables. At the end of the pole was a small disk you put between the thighs and it serves as half a chair. The cable would pull you forward as your skis found their way along the snow. It was like skiing up. Sometimes, if there was a sudden hill you might find yourself airborne for a moment, a scary feeling that was not meant to be. Other times a sudden jerk might pull you quickly forward, or a little to the right or left. Occasionally it would stop and I once found myself slowly lowering with my rear almost meeting the ground before my skis went backwards and I was again standing. My skis went along the tracks as I was pulled up and I looked, a little concerned, at theledge to my right. It was very close to the tracks my skis were moving along. I tried to steer a little to the left, and was then pulled back to the right over the ledge. “OH SH*T” escaped my lips as I dangled perilously in mid air. Pardon my French. I tried to hold onto the pole but I was dropped down to beneath the path and beaten against the snowy side I had just fallen from. I let go and found myself on a ski slope. There was a fair sized crowd of people who had stopped to watch the spectacle and were laughing at me. Pocahontas had heard my expletive and came down to get me. 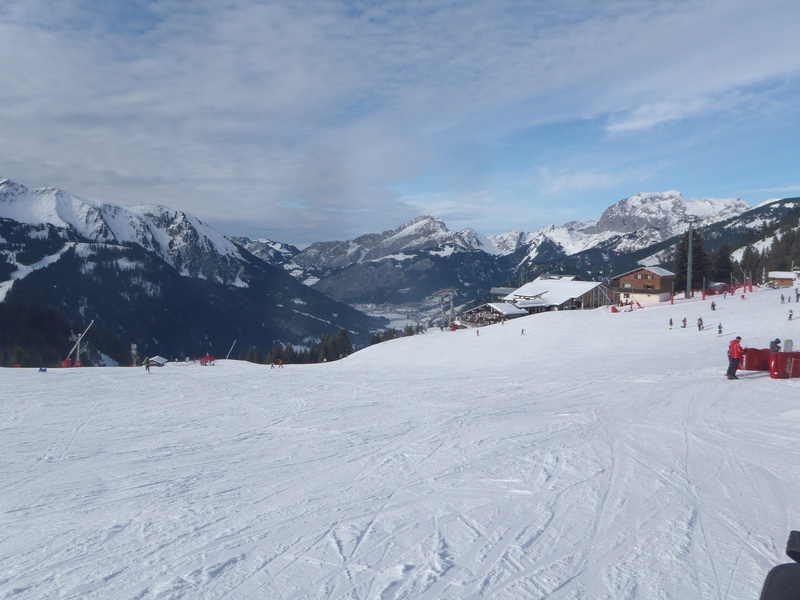 We skied down to the lift and tried again, this time and for the rest of the day she was behind me in case I fell again. The weather was just right and we stopped for lunch at a pleasant place a ways down themountain that still had the amazing view. We sat on our skis to keep the snow from freezing our bums. She told me how in the summer she would come hiking in this area, and about how beautiful the now white lakes were. Their were a fair number of dogs at the slope, I think they belonged to the people working there. They walked around and seemed to be enjoying themselves as much as everybody else. One man was sledding with his. Up on the mountain there were people snowshoeing and cross-country skiing and snowboarding. Their were many different kinds of skis, and the ones that I had, borrowed from the neighbors, were apparently the latest and the greatest. They were much shorter and wider than the skis that I had grown up with. 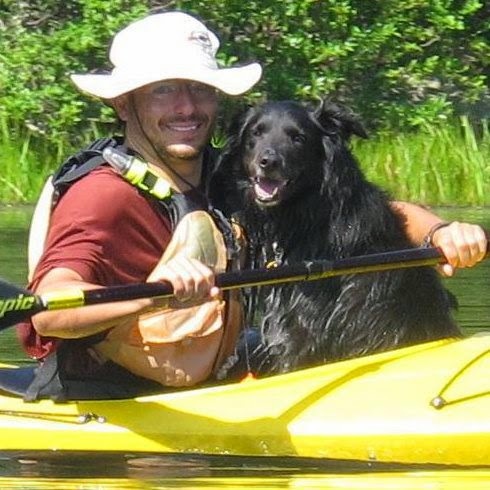 While Pocahontas was a master, when we were on the lift people assumed that I was the expert of the two of us. We spoke to each other in English so others assumed we didn't speak French. Thus we became privy to there conversations about us. I was on a different lift, much like the one I had fallen off of, when a little girl in front ofme fell. They stopped the lift until she was back on and gave a thumbs up. It started again. Farther up the lift pulled us on a small path through the woods when I lost my balance and went down. I forced my skis back under me and made a miraculous recovery, only to fail at the last moment and go down again. Rather then pull myself upright, since I couldn't seem to stay there, or continue to let myself be dragged up on my side, since I didn't think this was good for my coat, I let go and scurried off the track into the woods. Pocahontas, the ever patient, was soon beside me wondering what we were going to do. We could ski down through the woods, probably not a good idea, or go up. Up was a short ways, and with my cross country experience I might even have been at a slight advantage. Fifteen minutes later we were at the top. We skied all day and almost never skied the same trail twice. The lift at the bottom of one path would take you to the top of another. It was a truly amazing time, and a wonderful thing to have on my bucket list. I can't check it off though since I want to do it again. *I was the slowest person out there, but Pocahontas waited patiently for me. you didnt need a neuroscientist to tell you beer dont kill brain cells.. i told you that on our west coast trail hike. salud! cheers! l'haim! cant wait to sit down and have a beer with you someday soon! remember us? from the hostel? your blog is a good read. entertaining. was thinking you should put up a map on your blog, of your starting point, your trail and where you are. good idea, right? get on it! Thanks for the thought! You guys are some of the coolest I'v met so far. Hi Dov, I've been following you through your adventure. You really need to write a book about this when you get to your destination. I'm glad you are still with us and safe, relatively speaking. We are living vicariously through you! Thanks so much Jody! I do hope to write a book, maybe I'll even manage to sell a copy to someone other then my mother.